The Smart Brush and Detail Smart Brush tools in Photoshop Elements enable you to selectively apply an image adjustment or special effects that appear on all or part of your image. These adjustments and effects are applied via an adjustment layer, meaning that they hover over your layers and don’t permanently alter the pixels in your image. 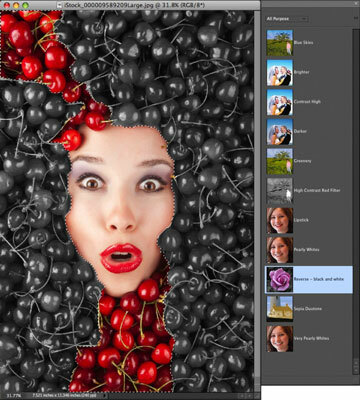 Select the Smart Brush tool from the toolbar in Edit Full mode. The tool icon looks like a house paint brush with an adjacent gear. You can also press F, or Shift+F, if the Detail Smart Brush tool is visible. Choose your desired brush attributes, such as diameter and hardness, from the Brush Picker drop-down panel. Smart Brush tool settings on the Options bar. Select an adjustment category and then a preset adjustment from the Smart Paint drop-down menu on the Options bar. Note that you can tear off this panel from its place by grabbing the grip area in the upper-left corner of the panel and dragging it anywhere in your application window (Windows) or on your screen (Mac). 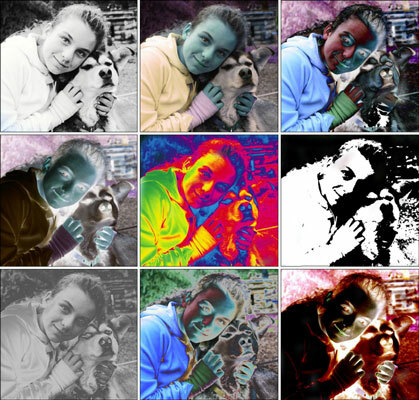 In the Smart Paint menu, you can find adjustments ranging from photographic effects, such as a vintage Yellowed Photo, to nature effects, such as Sunset (which gives a warm, orange glow to your image). The Smart Brush enables you to paint on adjustments. Paint an adjustment on the desired layer in your image. Note that while you paint, the Smart Brush tool attempts to detect edges in your image and snaps to those edges. In addition, while you brush, a selection border appears. Using the Add and Subtract Smart Brush modes, fine-tune your adjusted area by adding and subtracting from it. When you add and subtract from your adjusted area, you’re essentially modifying your layer mask. Adding to your adjusted area adds white to your layer mask, and subtracting from your adjusted area adds black to your layer mask. In fact, try them all out before you settle on your final choice. If you feel you need to refine your selected area, select the Refine Edge option on the Options bar. If you’d rather apply the adjustment to your unselected area, select the Inverse option on the Options bar. If you want to modify your adjustment, double-click the Adjustment Layer pin on your image. The pin is annotated by a small, square, black and red gear icon. After you double-click the pin, the dialog box corresponding to your particular adjustment appears. You can also right-click (Right-click or Control-click on the Mac if you’re using a one-button mouse) and select Change Adjustment Settings from the contextual menu that appears. Or you can select Delete Adjustment and Hide Selection from the same menu. Select the Detail Smart Brush tool in the toolbar in Edit Full mode. This tool shares the flyout menu with the Smart Brush tool. You can also press F, or Shift+F, if the Smart Brush tool is visible. Choose a brush tip preset and brush size, and attributes from the Brushes drop-down panel. Detail Smart Brush tool settings on the Options bar. Change your brush tip and size as needed for your desired effect. For better accessibility, you can tear off this panel (and the Smart Paint panel in Step 3) by grabbing the grip area in the upper-left corner of the panel and dragging it anywhere in your application window. Select your desired adjustment category and then your particular preset adjustment from the Smart Paint drop-down menu in the Options bar. Several of the Special Effect adjustments are shown in the following figure. The Detail Smart Brush lets you paint on a variety of special effects. A new adjustment layer is automatically created with your first paint stroke, along with an accompanying layer mask. Follow Steps 5 through 8 in the preceding list for the Smart Brush tool.